We’re seeing records fall in all directions this year—wettest, driest, warmest, coldest, snowiest, stormiest, fieriest—across the globe. In the US alone, in the month of July alone, 1,079 total heat records have been broken or tied. That’s 559 broken, 520 tied…so far. 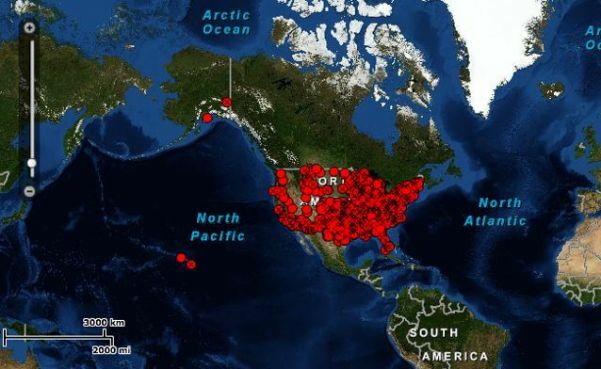 The map below, generated today at NOAA’s US Records page, shows how records have fallen nationwide, including in Alaska and Hawaii. In fact, every state except Delaware has broken heat records so far this month. 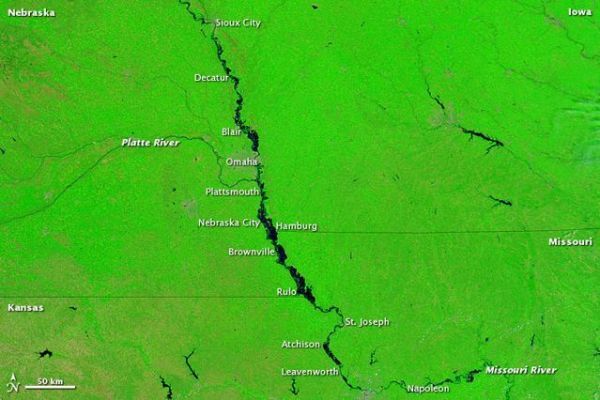 In Iowa yesterday, the heat index exceeded 130°F/54.4°C—an extremely rare occurrence in this part of the world. According to Jeff Masters, writing at his Wunderblog, the only place where a 130°F heat index is common is along the shores of the Red Sea in the Middle East. However, Delaware won’t dodge the heat bullet much longer. Its own records will likely tumble hard later this week. The image above shows the predicted maximum heat index (combined heat and humidity) for July 22. Parts of all but 3 states—Idaho, Oregon, and Washington—are predicted to exceed 100°F/37.7°C. Delaware—in scary yellow—is predicted to rise above 115°F/46.1°C. Ricky Rood points out in his Weather Underground blog that much of July’s heat in the US is compounded by extremely high humidity. And much of the extreme humidity this year is fueled by the extreme floods and saturated soils still plaguing the Midwest. Now if I was a public health official, and I was trying to understand how a warming planet might impact my life, then here is how I would think about it. First, the Gulf of Mexico and the Pacific are going to be warmer, and hence, there will be more humid air. This will mean, with regard to human health for the central U.S., heat waves will become more dangerous, without necessarily becoming hotter. 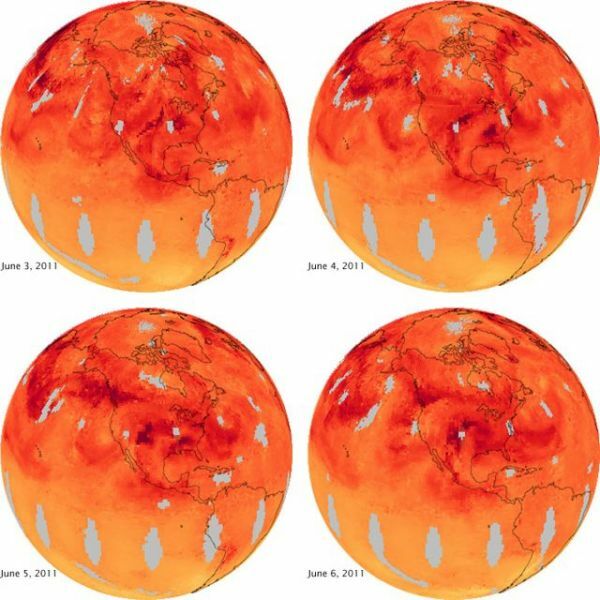 It is also reasonable to expect heat waves will become more frequent and last longer, because those persistent, stuck high pressure systems are, in part, forced by the higher sea surface temperatures. If I am a public health official here is my algorithm—heat waves are already important to my life, and they are likely to get more dangerous, more frequent, and of longer duration. 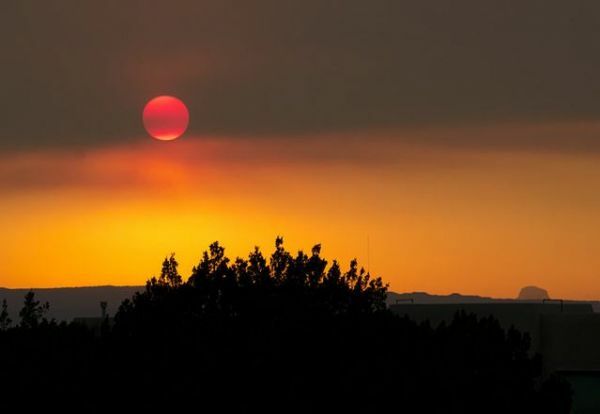 In other parts of the country this year, the extreme heat is compounded by extreme drought—with extreme outcomes, including the haboob that struck Phoenix on July 5. The time lapse video is amazing. The drought in the south central and southeast of the United States reached epic proportions. Carlsbad, New Mexico, went 233 days with no measurable precipitation until a meager 0.01 inches fell on June 2nd and it has not rained again since (as of July 15th). Pecos, Texas, just received 0.02 inches of precipitation on July 14th, its first measurable amount since September 23, 2010 (293 consecutive dry days). Albuquerque, New Mexico, has only had 0.19 inches of precipitation since January 1st (as of July 15th). For the period of January through June, this year has so far been the driest on record (117 years) for the states of New Mexico, Texas, and Louisiana. 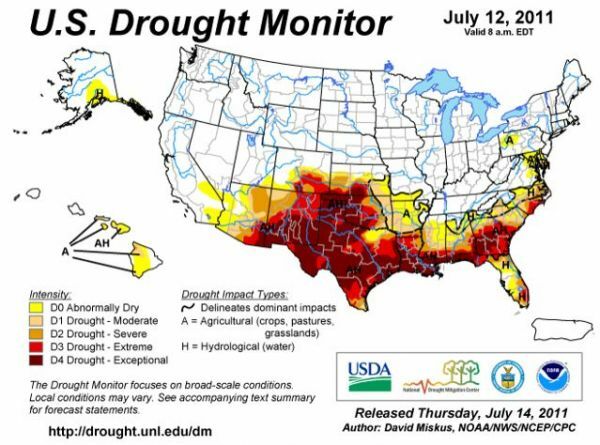 The above image shows the latest drought conditions in the US where “exceptional” drought is plaguing much of the south. The trend is worsening, as you can see in this 12-week animation. Another way of looking at this map is to realize the dark red areas are places where crops are going to fail this year. Of course drought fuels wildfires too. 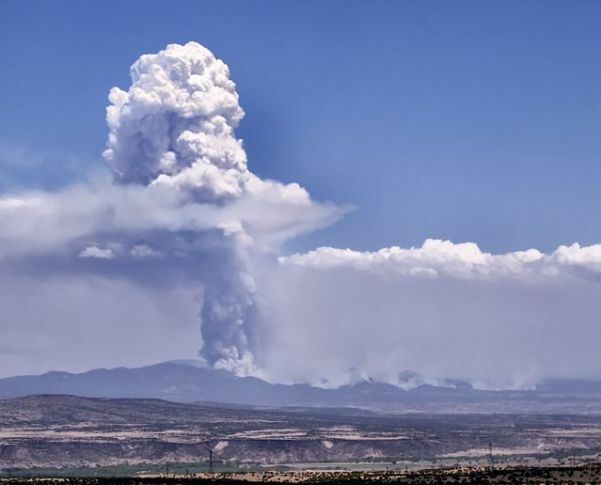 Arizona and New Mexico both experienced their largest wildfires in history during June and July. 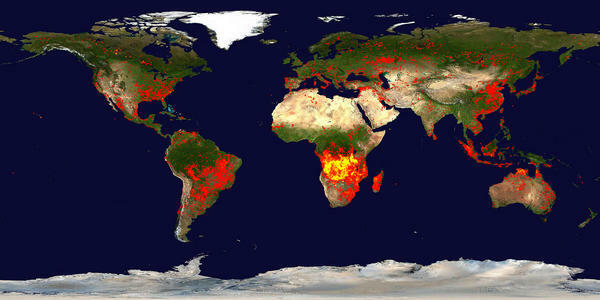 In the image above, you can see the global fire situation between June 30 and July 9. As bad as the fires in the US, obviously, they’re a whole lot worse elsewhere. According to the National Interagency Fire Center, the number of wildfires in the US as of the beginning of July this year is 36,424…and counting. These wild lands blazes have burned 4.8 million acres. That’s an average of 132 acres per fire—which, by the way, is the largest burned acreage ever recorded in the US during this time period. Carbon monoxide is a colorless, odorless gas that damages human health by limiting the flow of oxygen through the body. It is also a key ingredient in the production of harmful ground-level ozone and urban haze. 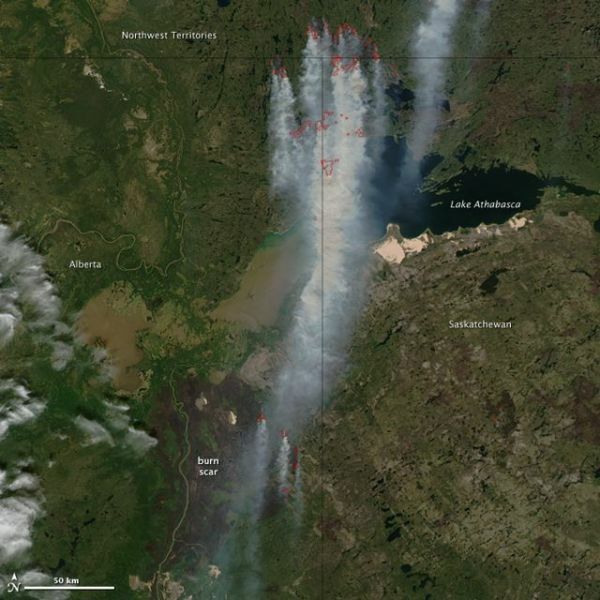 Today’s mega-smoke producers are found in eastern Manitoba and central Ontario. 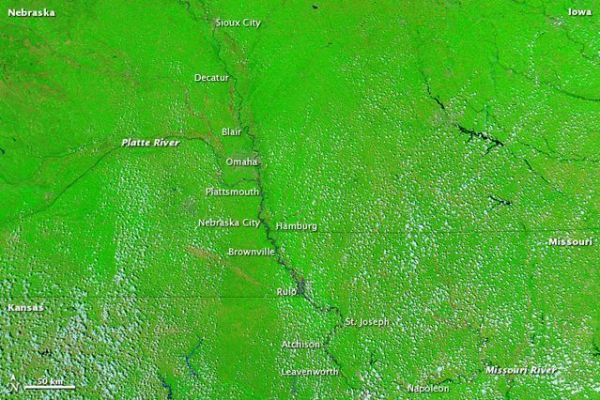 In the image above you can see the moderate-to-dense smoke plume crossing the border. The US Air Quality Smog Blog. And where there’s smoke, there’s particulate. You can see above how Canada’s wildfires are driving today’s poor air quality (yellow dots) in the Great Lakes region. Alone, heat, humidity, and smoke are lethal. Combined, they’re a juggernaut. In Russia last year, a combination of extreme heat and extreme smoke from wildfires killed an estimated 56,000 people.